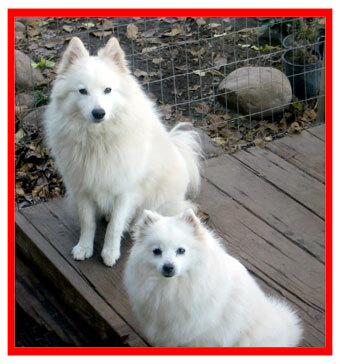 Heart Bandits is a dog rescue organization devoted to the American Eskimo Dog. Founded in 1996, Heart Bandits rescues American Eskimo Dogs in need, provides loving care, and finds them qualified, permanent, adoptive homes. from shelters, humane societies and from situations of neglect and/or cruelty. from concerned citizens who have found them as strays. whose owners can no longer provide a permanent home by finding them new permanent and loving homes. Heart Bandits is a nonprofit federally tax-exempt 501(c)3 organization with chapters across the USA and Canada. Our Chapter Directors, Foster Homes, Officers, and Trustees are all volunteers. We are not shelters with visiting hours. Our rescue efforts are managed out of our own homes. Expenses are funded through our Membership, adoption fees, and donations. Your support is greatly appreciated. What is an American Eskimo Dog? American Eskimo Dogs are often called "Spitz", however, "Spitz" is not a breed of dog, but rather a group of breeds with similar characteristics. Some of the other breeds included in the Spitz group are Keeshonden, Finnish Spitz, and Pomeranians. The preferred nickname for the breed is "Eskie". 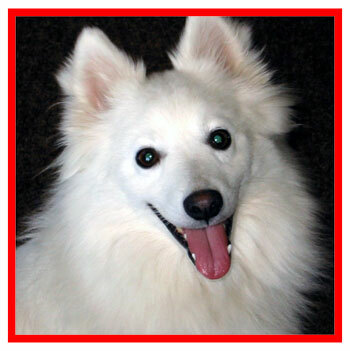 American Eskimo Dogs are highly intelligent and make wonderful companion animals. Eskies have white or cream colored coats and come in standard (15"-19" - at shoulder), miniature (12"-15"), and toy (9"-12") sizes. Why the name Heart Bandits? Because given the smallest chance to do so, an Eskie will steal your heart! 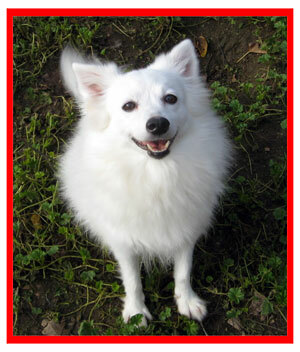 The American Eskimo is one of the most intelligent of all canine breeds. They are very curious. They will examine changes in their environment with a wary, yet inquisitive eye. Their antics while playing will often cause you to grin or even laugh. They are very social and very aware of their family. They are very loving. They always seem to know when a family member needs to be cheered-up or to simply be loved. Anyone who has ever had an "Eskie Hug" truly understands their unique ability to love. food & supply needs for these Eskies.